Here Kitty Kitty. A Recent Study Suggests Cats Kill Up to 18 Billion Small Creatures Per Year! Can Putting Up A Fence Keep Them In (Or Out Of) Your Yard? A recent study from the Smithsonian Conservation Biology Institute suggests that cats kill up to 3.7 billion birds and 15 billion small mammals per year. For some people, that may come as welcome news, as their thinking is that the cats are killing common pests like mice and rats. Not true. According to Pete Marra, an animal ecologist and a member of the team that conducted the study, the majority of the mammals that are killed are native woodland creatures like voles and chipmunks. And while pet cats do play a role, feral cats bear most of the responsibility. Often cat owners will let their cats come and go from the house as they please, knowing that the cat will return. 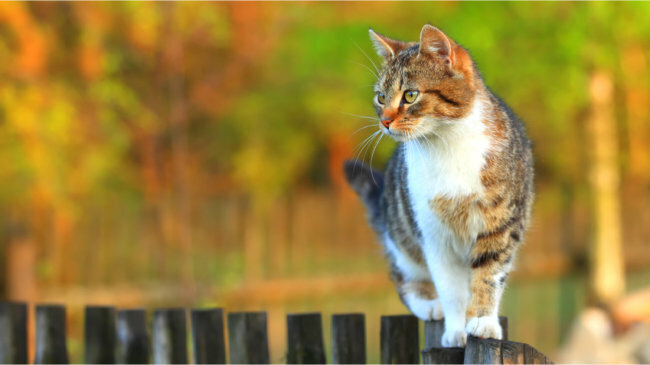 Aside from the danger of getting hurt by larger animals or other feral cats, letting your cat roam can increase the likelihood that they are off hunting. If the last thing that you want to see is Snowball returning home with a dead bluejay or chipmunk, then you need some way to contain it to your yard and keep other animals out. But is there any kind of fence can keep a cat in? Can't they just climb, dig, or jump whatever obstacle you put in their way? After all, cats have a strong natural instinct to hunt, and will go to just about any lengths to fulfill that desire. The truth is, after much debate and discussion, the general consensus in our office is that no fence can 100% keep a cat in and that best way to ensure that your cat doesn't leave the yard is to keep them in the house. But, we'll stay on the case and keep researching until we find the best method. In the meantime, we would love to hear what our readers think. If any of you have successfully contained your cat in your yard, leave us a comment to let us know how you did it. As part of a new pilot program, when you see the logo above on an item in our store, that item qualifies for free standard shipping on any order over $250. 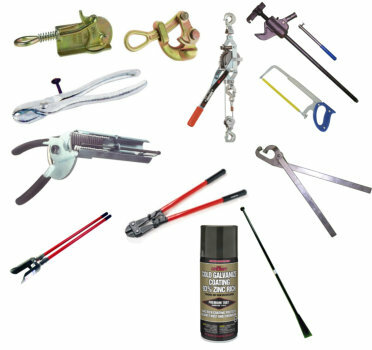 Almost all of the new tools, paints, and solar lighting supplies in the store qualify. As do most of our ornamental gate hinges and latches. 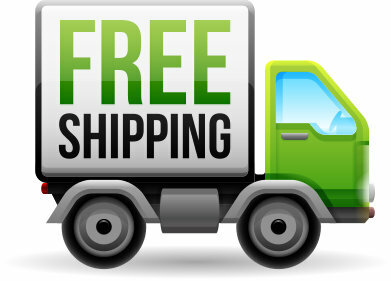 And the really big news is that Westbury Railing qualifies for free shipping, in some cases with the order of just one section. 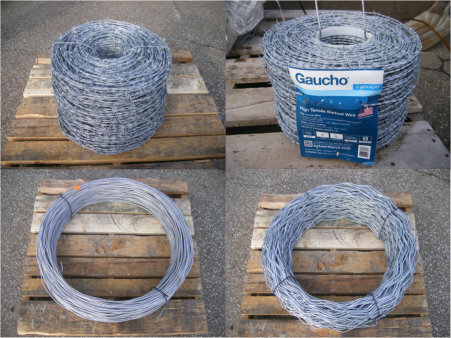 We forgot to mention yesterday that our new chain link wire category also includes galvanized barb wire, razor wire, tension wire, and utility wire. We also sell all of those items in vinyl coated varieties, which will be coming soon to the store. All of the above types of wire are eligible for the same quantity discounts as our chain link fabric. Great news for our professional and DIY customers. In addition to our large selection of chain link fittings, slats, and accessories, we now offer galvanized chain link fabric from 11-1/2 to 6 ga. and vinyl coated chain link fabric in 9 ga. extruded and 8 ga. fused & bonded. 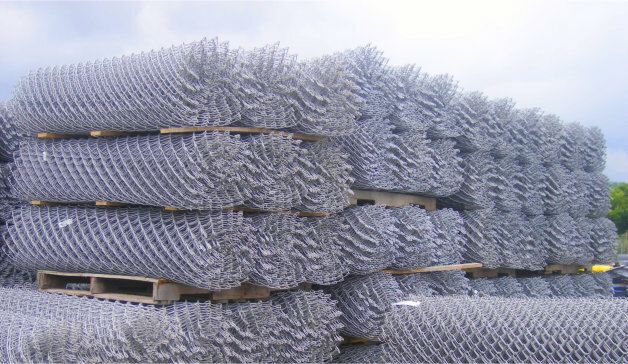 All of our galvanized wire is galvanized before weave (GBW). That means is that the wire is galvanized when it is still a single strand, and not after it has been woven into a chain link mesh. GBW wire is typically smoother than Galvanized After Weave (GAW) because when GAW wire is dipped in the zinc galvanizing solution, it tends to not drain evenly and the drips harden to form little zinc "icycles" (See images below). These icycles can be sharp enough to scratch and cut your hands during and after installation. They also make the wire harder to stretch because the knuckles get frozen in the excess zinc. Our vinyl coated chain link wire comes in 2 varieties, 9 ga. extruded and 8 ga. fused and bonded. The 9 ga. is great for residential projects, while the heavier core 8 ga. is ideal for commercial and industrial work. We are also offering the following quantity discounts on all wire. The more you buy, the more you save. The discounts are applied automatically when you check out, so there are no hoops to jump through to get them. As always, if you have any questions email us and our fence and railing expert support staff will be happy to help you. A Fence Slat (Privacy Slat) is a metal or plastic insert that turns a chain link fence into a privacy fence. Most slats are made from either aluminum or some type of plastic. Slats can be used for more than just privacy. They can be combined in different colors to make designs or for corporate branding. 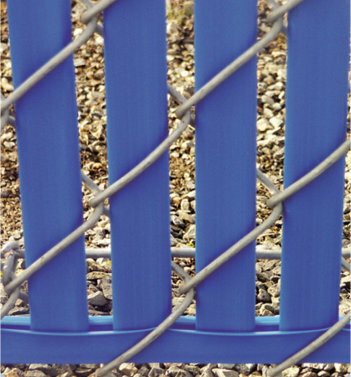 Below is a list of different types of PDS Fence Slats which are manufactured by Pexco. 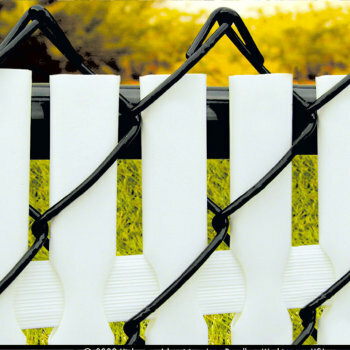 They are all made from extruded High Density Polyethylene, a plastic that is resistant to UV and chemical exposure, with the exception of the hedge slats which is made with galvanized wire and PVC. They range in style, privacy factor, ease of installation, and cost. 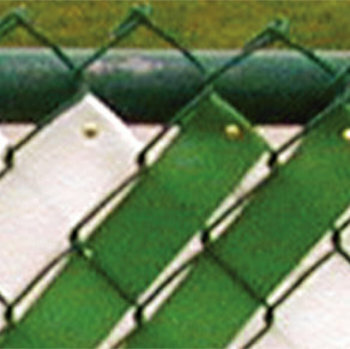 Typically a bag of slats will cover approximately 10 linear feet of chain link fencing. Flat, tubular plastic inserts that have an elliptical shaped hole routed at the top. They are installed through the mesh, and then a flat polyethylene channel is inserted through all of the slats to lock them into place. They offer approximately 75% privacy. The main benefit to top locking slats is that they all lock at exactly the same place, so the line of slats stays uniform at the top. 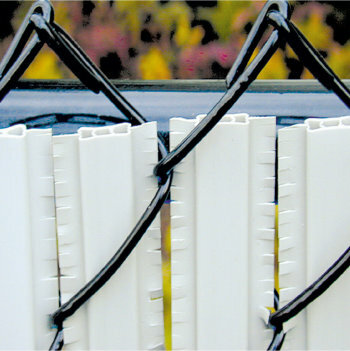 Flat tubular plastic inserts that slide through the chain link mesh and lock into a plastic bottom channel. PDS Bottom Lock Slats have reinforced legs through the inside of the slats to help them maintain their shape. They offer approximately 75% privacy. Bottom Lock Slats are easier to install than Top Lock Slats, but they don't align as well at the top of the fence. Reinforced inserts that have additional, serrated plastic wings on the sides. They are self locking, in that the serrations grip the chain link knuckles to hold the slats in place. The wings also offer near full (90%) privacy. Winged slats take more time to install because the serrations catch on the chain link. A flat, plastic extrusion that is sold in long (250') rolls. Fence weave is woven through the chain link mesh and cut at the ends. It is then fastened with brass fasteners. The process takes longer than installing slats because of the effort involved to weave through all of the diamonds. The weave offers 70% privacy. 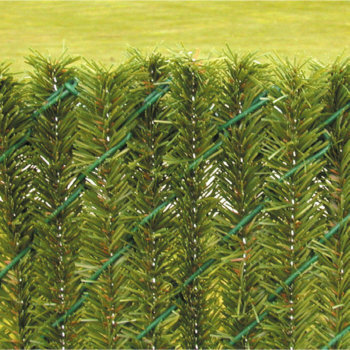 Constructed of 16 gauge galvanized, braided wire core and 3-mil PVC needles, HedgeLink slats mimic real hedges and do a great job of providing privacy while giving chain link fence a more natural look. According to this story on Officer.com the latest gambit by smugglers to get their drugs over the border fence involves making homemade cannons and shooting them across. 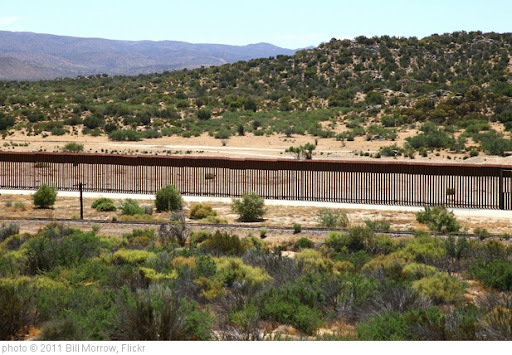 Apparently, the smugglers were able to shoot canisters full of marijuana over 500 ft. across a canal, but were foiled when a concerned U.S. citizen saw the canisters and called the border patrol. Be wary of any "Ballistics Engineering" job opening's in Mexico. How Much Does a Fence Cost? Budgeting for Your Fence to Avoid Your Own Personal Fiscal Cliff. There's been a lot of talk about fiscal cliffs and budgeting lately; at least on a national level. So to get into the spirit, we thought we would provide a few helpful numbers to help you budget for your fence project. So What Does a Fence Cost Anyway? The estimates below are based on an average 200 linear foot residential fence - 6' tall with 2 pedestrian gates. As you can see from the table, the type of fence you choose makes a big difference in the overall cost, with aluminum coming in at roughly 60% more than wood (long term maintenance costs not withstanding) and vinyl in the middle. The second cost factor to consider is whether to build the fence yourself or hire a fence contractor. If you have the time and are moderately handy, you can save a significant amount of money by going the DIY route, particularly if you already have the tools. At a minimum you'll need either an augur (which can be rented) or a post hole digger, circular saw, hammer, drill, level, measuring tape, string, and wheelbarrow. On the other hand, if you decide to hire a fence contractor or handyman keep in mind that labor rates vary greatly from depending on which part of the country you live, the terrain and soil type, and the skill level of the installation crew. So, the estimate below may not reflect what you would actually pay for your fence installation. Also note that, just like any other home improvement project, there can be additional costs if/when the unexpected happens. For example, if you thought that your soil was smooth and sandy, and then you hit a large boulder when you go to dig your post holes. Or, as happened to one customer, your utilities provider mis-marks your line and you end up hitting it with the augur, cutting out phone service for half the neighborhood. The point is, you never know what could happen, so budget a little more (10-20%) than you think necessary. If you don't end up using it, then you can always put it toward a nice vacation.